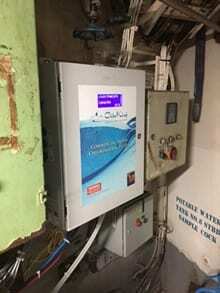 Sanitising Seawater on Cruise Ships - ChlorKing, Inc.
ChlorKing has introduced Chlor SM salt chlorinators with specially modified plates to sanitise sea water for on board recreational water facilities on cruise ships. Tests on 10 cruise vessels have shown a saving of 20-25% on pool sanitisation expenses and an ROI of 18 months or sooner by eliminating the costs associated with buying and storing bulk chlorine on board and the need to store and handle it, being classed as a marine pollutant. They are also claimed to eliminate the safety risks of fires or the creation of toxic gases that can be spread through a ship’s HVAC system. “Some 90% of a ship’s passengers use swimming pools, spas, Jacuzzis and even on board water parks, and with an increased emphasis on keeping passengers on the ship with more activities to increase revenue streams, there’s an incentive to maximise the recreational water experience while cutting costs to protect margins,” said Steve Pearce, Group Executive Vice President, ChlorKing. “While cruise ship lines can buy bulk chlorine inexpensively, and they still need to buy and store muriatic acid and test their pool water to keep it in balance. With seawater as a natural resource for recreational water facilities, there’s no need to buy or add salt or chlorine, which is a toxic material and is subject to price increases. An additional benefit is that seawater adds calcium and alkalinity to the water naturally, reducing corrosion and the overall cost of operation,” he said. The new Chlor SM systems for ships are packaged to produce two to 28 pounds of chlorine per day to sanitise pools ranging in size from 2,500 to 1 mill gallons. All are single units with a maximum footprint of 20 in x 20 in for the power supply and 13 in x 28 in for the cell housing, representing a 50% size reduction and 33% weight reduction from previous models. ChlorSM chlorinators systems are claimed to have fewer moving parts and maintenance requirements than traditional chlorine systems and a smaller carbon footprint. They are engineered specifically for the harsh environment of commercial pools and have a 10-year service life.